We used cheap bride and groom ball caps I bought as a set for $10 on eBay. We wanted the shade of a ball cap instead of the top hat/headband combo. For the groom ears, just buy a cheap-o set of classic black mouse ears and cut them off, leaving a bit of the material at the base of them. We made slits in the sides of the ball cap and pushed the fabric at the base of the ears through, then covered it on the inside of the cap with black felt that was affixed using Barge, an industrial-strength adhesive they use to put soles on shoes. You can also use contact adhesive/cement made by Dap or 3M (and found at the hardware store). But Patrick doesn’t recommend hot glue because it isn’t a strong enough bond. The bride ears were trickier and more spendy, because you have to buy that headband. Patrick removed the ears, trim and veil, and then affixed the ears to the ball cap the same way he did the groom ears. It’s harder because of the sequins. There is a wire loop forming each bride ear, and when you detach the ears from the headband, there is wire at the bottom that can be pushed through the slits in the ball cap, and then covered with felt. When you cut the material off the headband you’ll see how the ears are attached to it and maybe be able to reuse that structure. Patrick used Barge to affix the veil and trim at the top. I’m looking at the bride’s cap, is it made with “paillette “. Glitter? The ball cap is just black embroidery thread on white cotton, but the ears have paillettes on them. They came that way on the headband I bought from Disney. Interested in purchasing a pare. You know, we don’t actually make these for sale, but I believe there are some sellers on Etsy who do something similar! 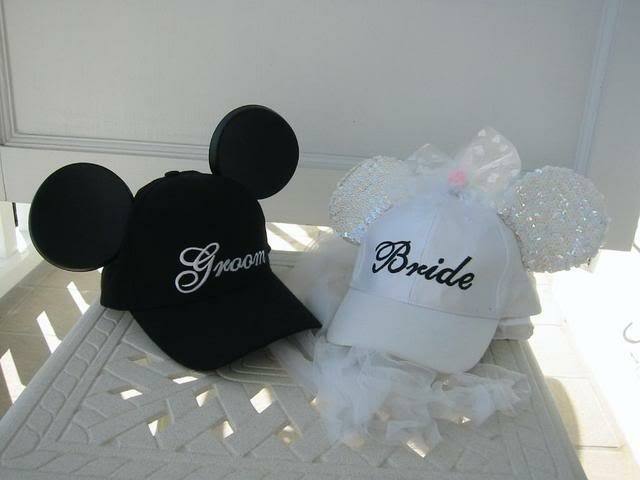 Hi, I really want the groom mickey ear baseball cap….I’ve been trying to find something because my fiance already has her bride ears. So how much and can I get it by 1st week of march? Hi! I do not make or sell these, I just posted the steps my husband followed when he made our caps for our honeymoon and anniversary. Hopefully you will find them easy enough to be able to do something similar yourself! But, where did you get the cheap-o Mickey ears from? We just bought the most basic mouse ear hat Disney sells and cut the ears off. I love these instructions. My 10th wedding anniversary is coming up and we’re going to Disneyland. I’m making these. Thanks for the instructions! Yay! I’m so glad you like them! Where did you find the ears? We cut the groom ears off a classic mouse ear hat, and the bride ears were from a headband sold at the Disney parks and resorts. So cute. I think i’m going to try to use this idea to make tophat groom ears, but we shall see. Gotta find a cheapish tophat first. Oooh – let me know how it turns out! Maybe the Halloween stores will have good cheap top hats soon. Thank you very much for these directions. We just made ours last night and cannot wait to wear them on our honeymoon next week! So glad you found them useful. Congratulations on your upcoming honeymoon! What did you use to make the slits in the caps? Patrick used a blade—like an X-acto knife. Hope this helps! How much WOULD you sell them for! I am very interested. We don’t sell these, but hopefully I’ve made the instructions clear enough that anyone with access to a craft store can replicate our work. Thanks for the kind words! 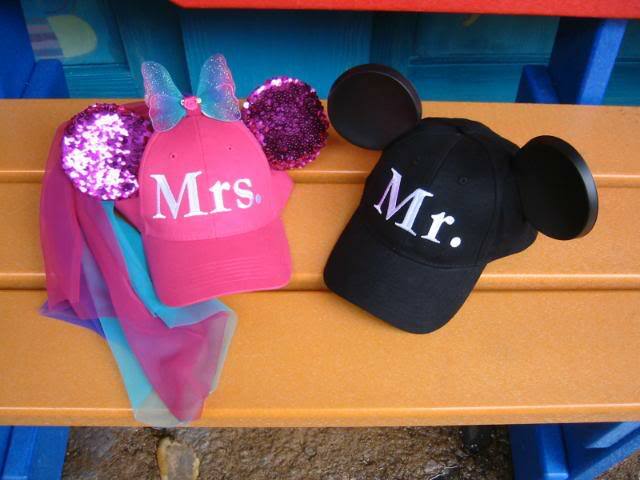 I would love the mr. and mrs one!! Can I have it before Christmas!